Hi! 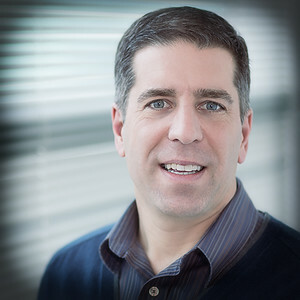 I'm Andy Webb, photographer and owner of Visionova, a very small, not-yet-for-profit company. After sharing photos on a smartphone with some friends, they encouraged me to put up a website, leading me to unearth my favorite treasures buried in the recesses of hard drives. Part of what colors a photograph is the surrounding story behind the image. As time permits, you'll find new anecdotes, photo tips, and historical references sprinkled throughout the site as I often slip into sidebar story mode (which in some cases helps improves on the weak visual). Check What's New for updates to story content and new photographs. I hope you are able to connect with the images on the site, perhaps recognizing familiar places, gaining photographic inspiration, or wanting to travel there - enjoy! Edison once said “I think in pictures.” But getting what I think through a lens and into a memorable image is such a challenge. A successful image captures the essence of a place or subject. Sometimes those pictures convey the light, the atmosphere, the strangest minor details, or just an abstract feeling. There's nothing like the essence of a place - indoors, outdoors, in streets, jungles, or wherever. Being in a place (particularly in the early morning) provides a unique quiet that allows you to witness the character and charm of a location without the drowning hubbub. As the changing sunlight rises, the smallest movements of creatures are amplified, illuminating silhouette-like imagery (a rooster, taxi, or a merchant opening shop). In a landscape, light pours over God’s earth (mountains, flowers, streams, etc.) and reveals details in the shadows. Discovering imagery in these moments is special. Capturing an image that reveals the essence of a place is a gift that connects you back to that moment. Cartier said that photography “reaches back to a moment.” If the resulting image visually causes me to reminisce details or begs me to return, that image works. This collection of images represents some of my favorite places on earth (Oregon, Italy, etc.) along with the essence found in the fine details of craftsmanship, architecture, autos, or cultivated gardens. And although creating portraits isn’t my forte, I also enjoy an occasional assignment, hopefully capturing the essence of each person. “Your photos look almost professional!” - it’s a remark I’ve heard a few times. There must be some shock factor between seeing images and knowing me (or some guy in business attire who follows basic composition sans all the artistic tattoos and piercings?). While many photographers aspire to become professional, the term simply means your livelihood depends on it. Are you sure you really want that? Going pro the traditional way (studio, stock, etc. ), may be a recipe for a starving artist (at least for me). Being an enthusiast (sounds better than an amateur, or whatever Canon decides to call a 5D user) keeps my passion for alive. Once you build a collection of keepers, people will eventually think you are a good photographer. You might even convince yourself! Technology has helped level the playing field. In this digital age, anyone can create the next viral image on a smartphone (and Instagram). Maybe even you! • Inspired by my grandfather, “Clarkie” (who always had an Polaroid, 35mm, or 8mm in hand). I still recall the anticipation as he checked his watch then peeled back the paper to reveal an "instant" image. • Growing up in Akron, Ohio, my dad shot slides. Slide shows were the best - gathering the family around in the basement, turning the lights off, and seeing the bright projected image on bed sheets (and laughing together). • I took a darkroom class in 4th and 5th grade summer schools at Fairlawn Elementary - loved it! Encourage kids to do creative stuff in summer school. • Switched to Photoshop 1.0, and paid (dearly) for every upgrade. Now Adobe has chained my credit card account. Through the Cuyahoga Valley Photo Society, I attended several 3-day workshops put on by some of the best nature photographers. Worth mentioning is a key influence - Jim Roetzel, a retired high school photography teacher and working professional. He’s been kind (and patient) enough to share his passion, provide (very) honest critique, and illustrate all the math (some of which I recall). He’s "mentored" a small group of people in the Cuyahoga Valley Photo Society (as part of the National Park). So if you want a great workshop, take his. Photography has a bunch of technical and compositional rules (and some math). It’s enough to scare people away. Despite the odds, I’ve learned a few things (and forgotten things I should know by now). After lots of failed images, the fundamentals become self-evident and just work their way into your routine. Focus on the emotion, rather than the photographic process. If you ask why you are taking an image and what needs to be communicated, it will help answer thehow (lens choice, aperture, angles, filters, technical stuff, etc.). Regarding printing, I don’t miss winding film, fingers wrinkled with chemicals, or hours in a dark room. The digital darkroom has reinvigorated my interest in printmaking. But despite the promise, computers don’t really save you time, they just present more potential options. However, it does allow flexibility in when you to stop and start. Photoshop, Nik, and panoramic stitching are among my favorite digital inventions!! Digital is fantastic, but you are always one menu setting away from failure! Did I remember to grab memory? • Get started being a photographer, help fund the photo industry! • If I can do it, your chances are pretty good too. 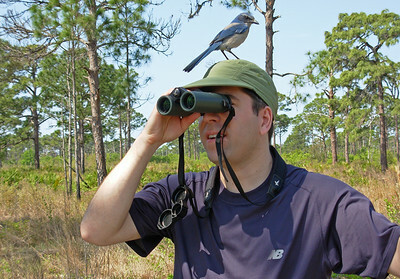 • Yes, that’s a real Florida Scrub Jay on my head (unaltered image below). • While a picture may be worth a thousand words… somehow I feel compelled to add a few more. “Details make the difference. Selecting which ones to focus on becomes the formula. A successful image happens when you pick the right details… you’ll know it when you see it. Where is the Scrub Jay ?